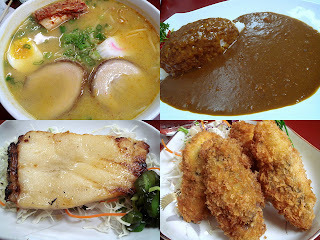 GO RAMEN!®: A Foo-Foo Birth-Tei! I didn't go to work today so I could enjoy a nice relaxing birthday doing nothing. Sounds like fun right? Well it started out that way, but when I went out to grab some lunch...BAM!...car accident. Out of nowhere a car just t-boned me. I'm okay, just a little whiplash, but my car may need a couple weeks to recover. Then after spending the rest of the afternoon dropping off my car at the body shop, picking up a rental car, and on the phone with insurance, I couldn't wait to have a comforting bowl of ramen. So naturally, I went to Foo-Foo Tei. So what did you think he returned with?...Yep, sushi! Can you believe it? This guy can do anything! He really must be Doraemon!! 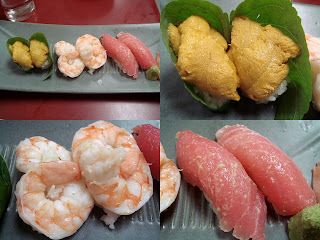 Surprisingly, the 3 items pictured below (uni, ebi, and chu toro) were extremely fresh--fresher than most sushi restaurants. I felt a lot of jealous eyes around me asking their neighbors if sushi was on the menu. Unfortunately it's not, but maybe you'll get lucky too someday. There's nothing like a nice meal to cap off a crappy day, but with a stiff neck and pulsing headache, I'm ready to go to bed. Good night! Thankfully, I made it through another birthday. Oh what a bummer. Sorry to hear about the T-bone hit. Yike. Chu toro O_O... not bad!!! how was the uni? I luuuuuuuuuuuuv uni, so... and I have yet to find anything compare to the live uni at Maki Zushi in OC. I was gonna try Wonton Forest last night, but they were close. I got there after 9pm DOH >_<. For a late dinner... there aren't much choices in Rowland Heights/City of Industry if it's -not- Chinese food. So I end up settle myself to try the ramen at Yummy House. MSG... -y-u-c-k-. Have you tried that place? @kelvlam: The uni was very good but I don't think it will compare to the live uni you've had. After all it is just a ramen-ya. Sorry to hear WoFo was closed when you got there. And I'm very sorry you had to eat ramen at Yummy House instead. I've never been but I've heard about it before. @Alice & kelvlam: Thanks for the b-day wishes and concern. It's just a little sore neck. Nothing a good bowl of ramen can't heal...hehe. Have a great weekend! i hope ur alright! make sure u get treatment!!! i've been in 3 accidents but i didn't really get treatment and now i'm feeling the consequences. My condolences on the accident! :( The most important thing is that you're OK.
@wonton forest: Thanks! Went to see the doc and he said it'll probably get worse before it gets better, but I'll be okay. Wow, you've been in 3 accidents. I'll try to stop by this weekend. Feel like some chiu chow. Oh man...and oh man! Happy bday and chu toro!! But sorry about the accident...dang, I just had a bad flashback to my t-bone accident a few months ago. I'm glad you're ok though. I almost forgot.. Happy Belated Birthday Keizo! Is that Uni Gunkan wrapped in Shiso? Never had it that way. I feel like being able to eat Ramen and Sushi together is very American and I love it! What do you think? Thanks Dennis! Yes, eating ramen and sushi is very American. Unfortunately, it's hard to find the best of both worlds under one roof. In my experience, whenever I see a place that's named nantoka ramen & sushi, it usually ends up being horrible...haha. Hey ed, almost forgot to reply to you. Hahaha...that was funny! I bet he could whip up some sort of bubble and I bet it would also taste really good! You have the same b-day as my aunt ^_^ There's a lot of you Scorpios out there! lol What a great day you must have had. Poor you! I am glad that you are okay. I feel your pain =*( Whiplash is evil. I have an extra neck brace if you need one! Hey, I hope you're alright with the fires so close by. I have enough relaxants too, but thank you!..lol. Hi ed, yeah we had to evacuate but I'm back home now and I think everything will be okay. Thanks for your concern! It's been one helluva week. I could use a good bowl of ramen right now! Sorry to hear about what happened to you. Hope you feel better. At least you got a sushi out of it! good to hear ur stuff is okay! Thanks Pepsi Monster! And yes, at least I got to eat sushi! Thanks wonton forest for letting me chill at your restaurant and enjoy the Chiu Chau!